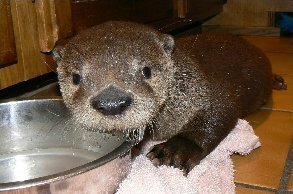 Since Pete, the orphaned otter cub, had suffered a Grand Mal Seizure, followed by a temporary paralysis in his lower extremities shortly after his admission to ARC, diving in to a baby pool of water just didn't interest him in the least. 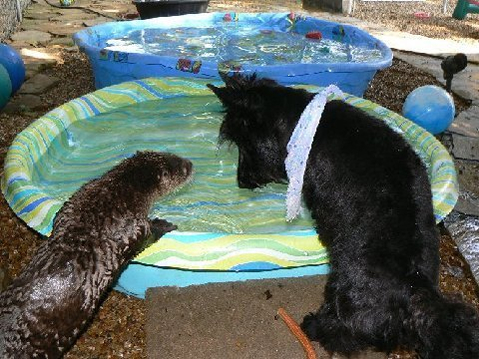 Try as we might to introduce him to the water he was born to love and spend most of his of his life in, Pete was determined to spend his days on dry land. 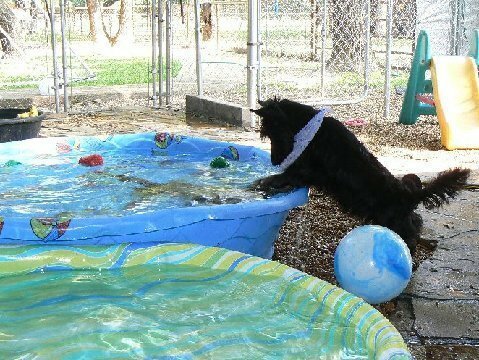 But Shu-Shu, a little Scottish terrier that is one of our permanent residents here at ARC, loved the water, and she seemed to know that little Pete should love it too. 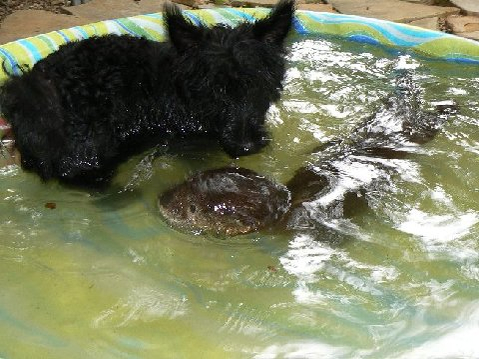 Shu-Shu became Pete's friend and companion. 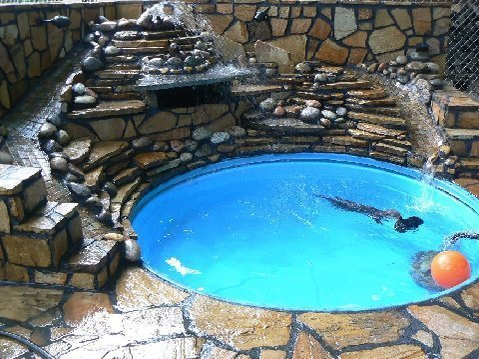 She would stand along side him observing the clear, blue water. 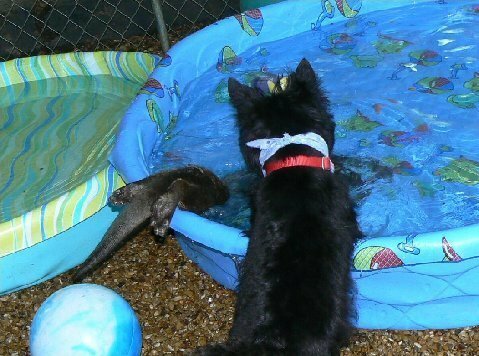 Then, the little Scottie would hop in and quickly look back to persuade Pete to follow her lead. 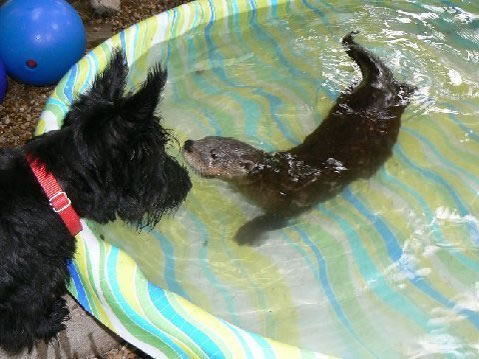 Days passed as Pete’s fears repeatedly overcame his innate instinct to take to the water, but Shu-Shu wouldn't give up on her furry little pal. Then, one day it happened. 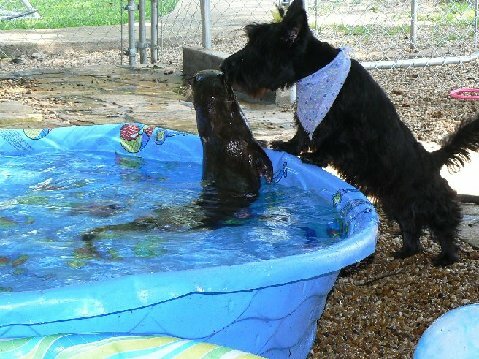 As the unlikely pair stood poolside gazing longingly at the water, Shu-Shu took the plunge, then swam over to Pete and gave him a little kiss…then SPLASH, Pete finally found the confidence to follow his buddy into the water. Only for a moment the first time, then out, then in, then out...then IN to stay. 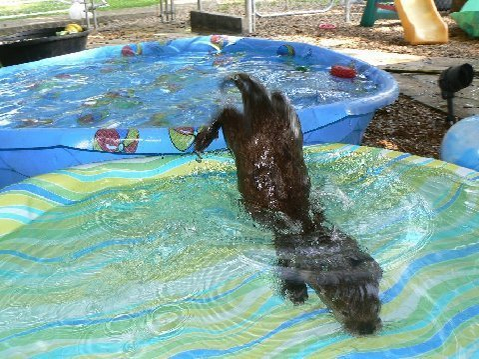 Because Shu-Shu just wouldn't give up on him, Pete finally took to the water just like an otter!!! Occasionally, nature reminds us with these sweet and tender acts of kindness and friendship between pairs of its normally unfriendly inhabitants, that this is, in fact, the greatest kind of love. These moments are examples, illustrations, for us all, for it is by this kind of love that others will know that Christ lives in us, to love even our enemies with our actions, and in truth (1 John 3:18), and as much as it depends on us, to live peaceably with all men (Romans 12:18). and has made his way confidently to the larger training pools here at the ARC.